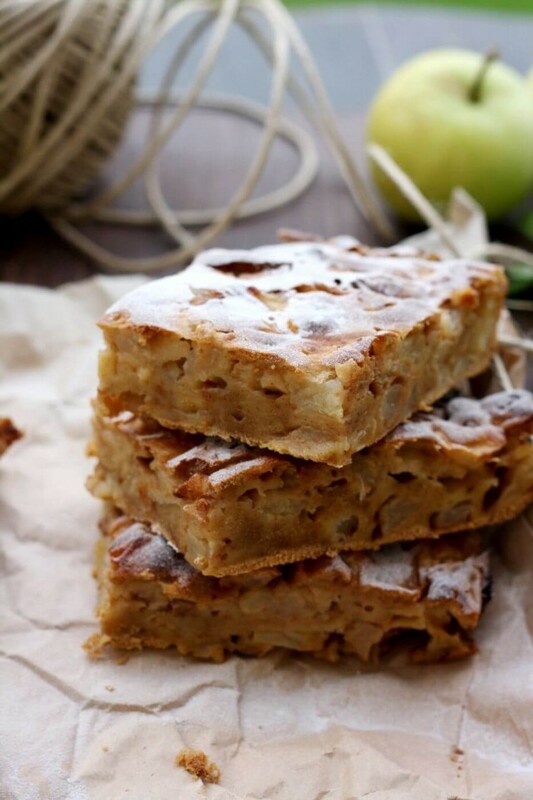 Sharlotka (Шарлотка) is the most well-known and easy Russian apple pie. 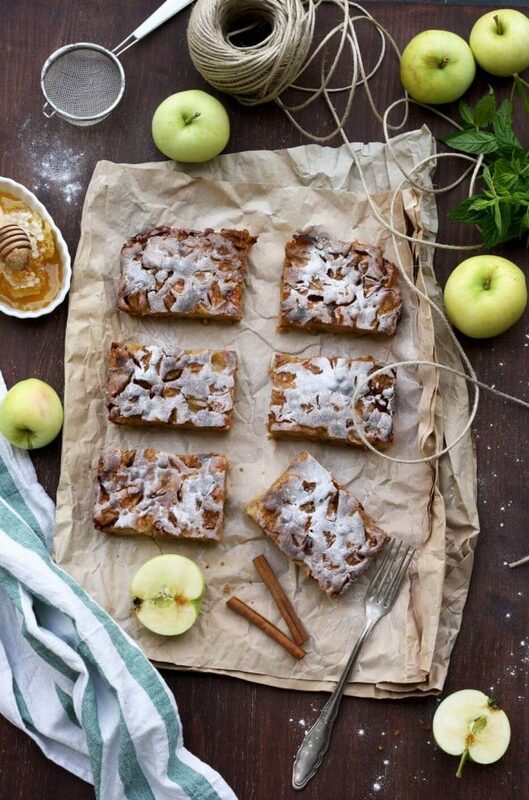 This recipe uses honey, resulting in the most moist, healthy and delicious sharlotka. Sharlotka is my grandmother’s signature dish, much like my mother’s Russian syrniki. 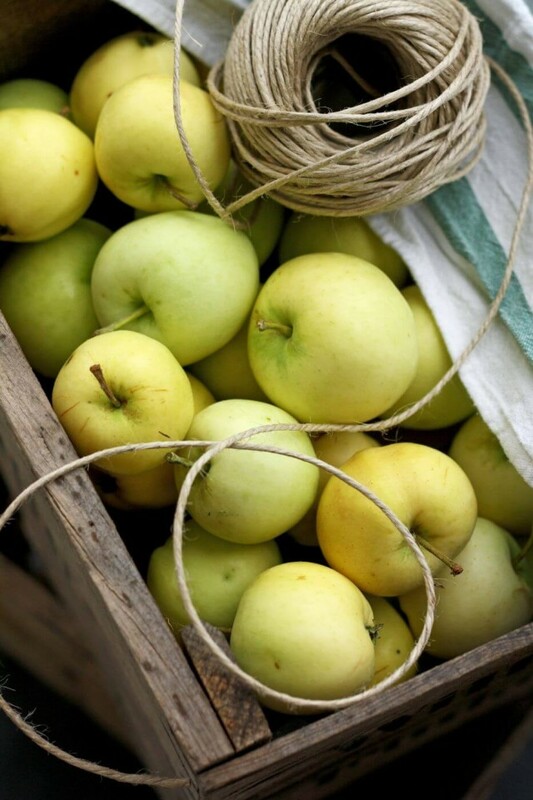 Moist, delicate, light, tender and airy, packed with apples from our garden, it was always my family’s favorite. 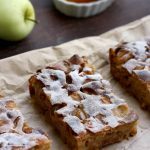 Making sharlotka is a great way to use up a bunch of apples, especially if you are looking for a really easy (and delicious) way to do it. Sharlotka is one of the most popular pies in Russia, if not the most popular, and the reason is that it’s super quick and easy to make, using very little ingredients that usually are on hand. 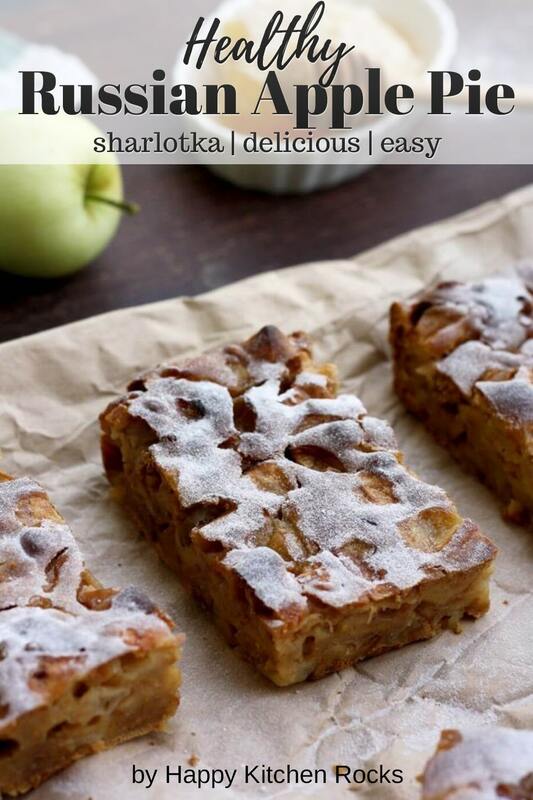 Besides, sharlotka is dairy-free and low in calories, as it’s made without butter. 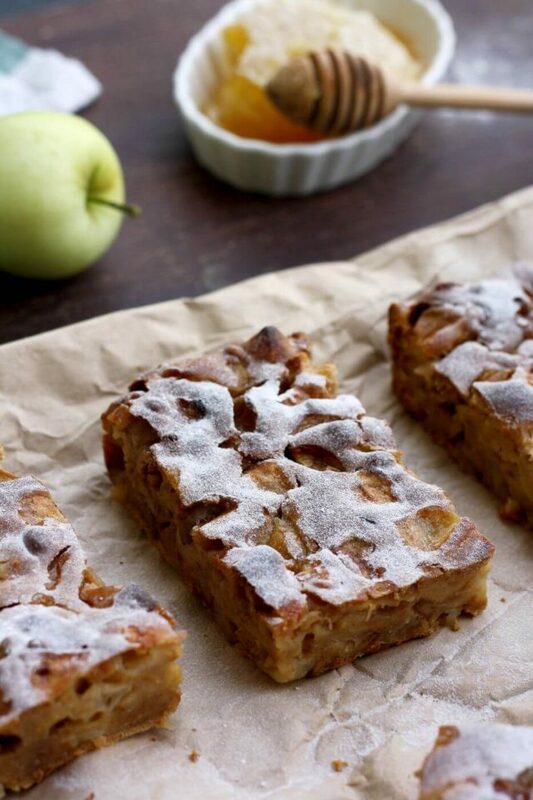 I adopted my grandmother’s recipe to a healthier version, substituting honey for sugar, reducing the amount of batter and adding more apples instead. The result was more than satisfying: it came out to be the most moist and delicious sharlotka I’ve ever made! Making sharlotka is so easy, it’s hard to believe. First, you have to peel and cut apples in chunks. 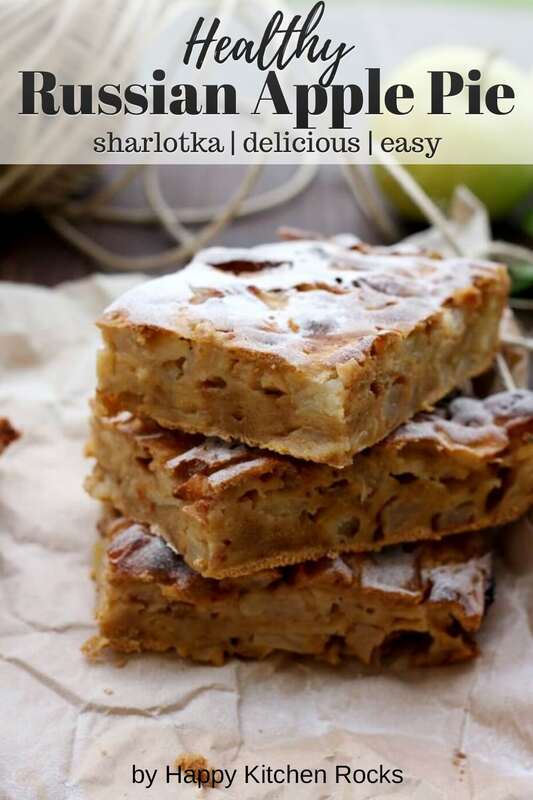 For this pie, it’s better to choose sour types like Granny Smith or Antonovka, as they are the best for baking, giving sharlotka a nice tart flavor. However, any apples would fit as long as they are not too sweet. I made it with Ginger Gold, that are rather mild, and it was still delicious. 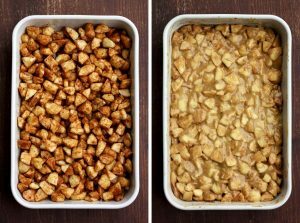 Once you are done with the apples, add cinnamon and transfer apple chunks to a baking pan, greased with a bit of olive oil. Make the batter: blend eggs with honey, add flour (I used equal amounts of whole grain flour and white flour, to make the pie extra nutritious), salt and baking powder. The consistency of the batter should be similar to sour cream. 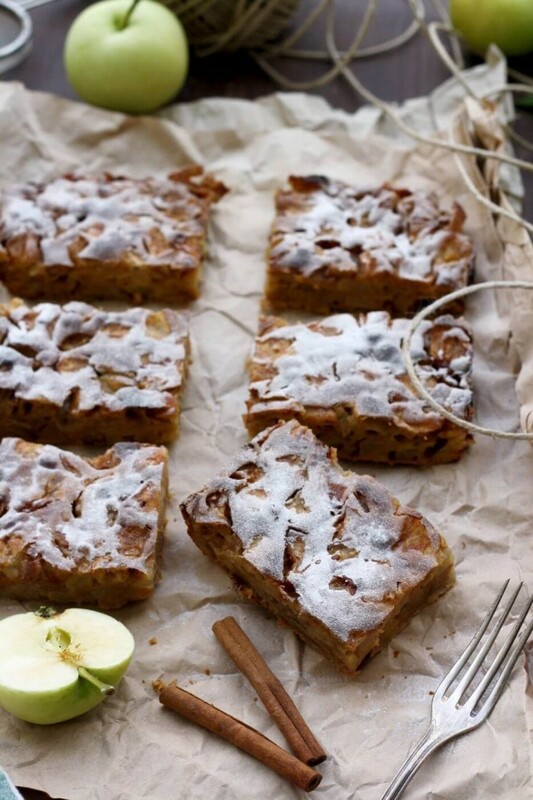 Pour the batter over the apple chunks and bake for about 40-50 minutes in a preheated oven. To check whether it’s ready, insert a wooden toothpick in the middle of the pie. If it comes out mostly dry, your sharlotka is ready! Turn off the oven and let it finish baking and cool in the oven for about 30 minutes. It stores perfectly in the fridge for 3-4 days, and it even gets better on the second day, so you can make this sharlotka 1-2 days in advance. Just a few words about how to make your dessert healthier by substituting honey to white sugar. You can’t just substitute it 1:1, as your cake will end up being too sweet, too moist and too heavy, because of the extra liquid in the honey. Therefore, the proportion depends on the consistency of your honey, its density, and sweetness. The general rule of thumb is: for every unit sugar, take 3/4 unit honey. In this recipe it’s better to use rather dense honey (as well as in baking in general). The more liquid your honey is, the more flour you would need to use to compensate for it. The baking time is also a little longer than with white sugar, and the baking temperature is slightly lower. If you want your pies to have a nice honey flavor and make it healthier and refined sugar free, try baking with honey and let me know how it was. 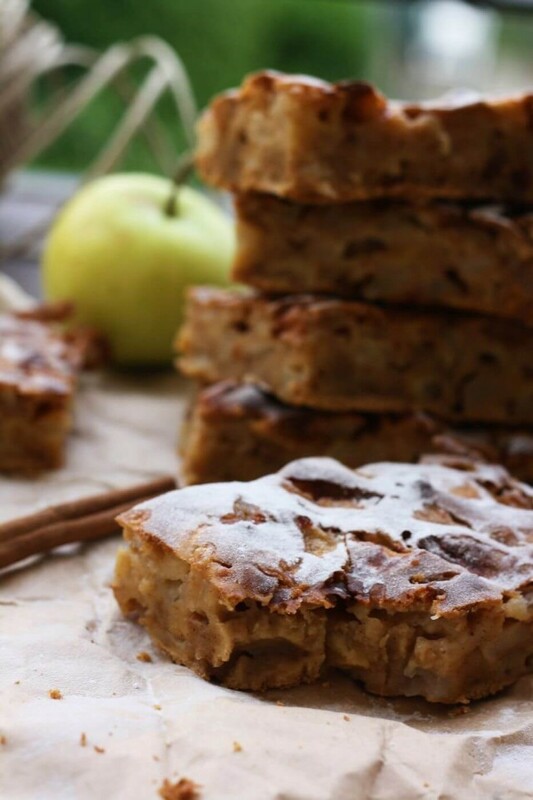 Here is the full recipe of my healthy Russian apple sharlotka. Hope you enjoy it! 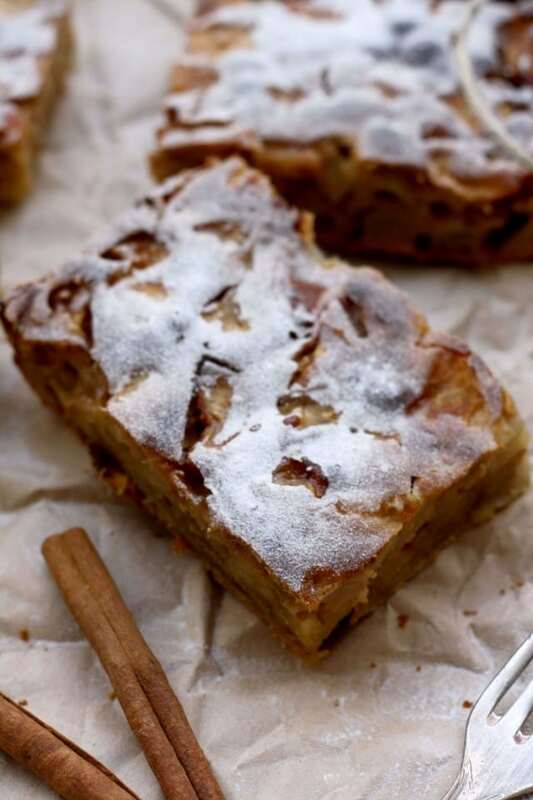 Sharlotka is the most well-known and easy Russian apple pie. This recipe uses honey, resulting in the most moist, healthy and delicious sharlotka. APPLES: Peel and cut apples in chunks. 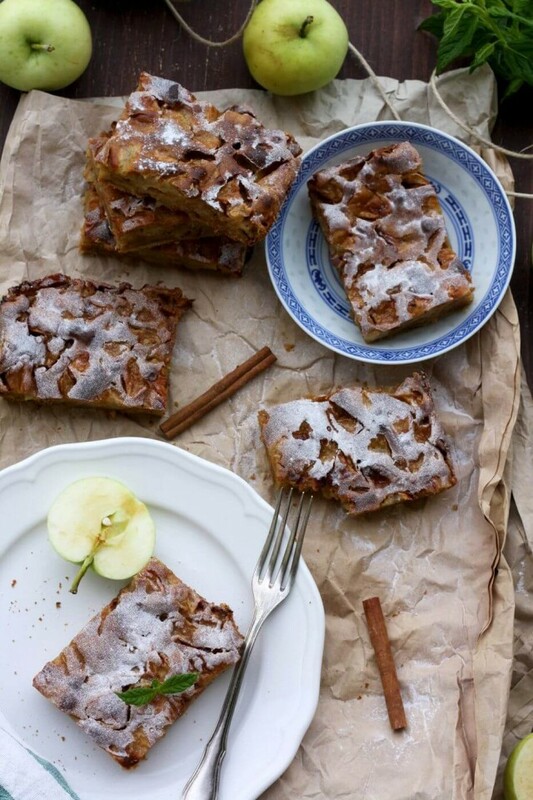 Add cinnamon and transfer apple chunks to a baking pan, greased with a bit of olive oil. Preheat the oven to 190 °C or 370 °F. BATTER: Blend eggs with honey, add flour, salt and baking powder. The consistency of the batter should be similar to sour cream. Pour the batter over the apple chunks. BAKING: Bake for about 40-45 minutes. To check whether it's ready, insert a wooden toothpick in the middle of the pie. If it comes out mostly dry, your sharlotka is ready! Turn off the oven and let it finish baking and cool in the oven for about 30 minutes. Enjoy! If you make this pie, don’t forget to take a picture and tag it #happykitchen.rocks on Facebook, Instagram or Twitter! 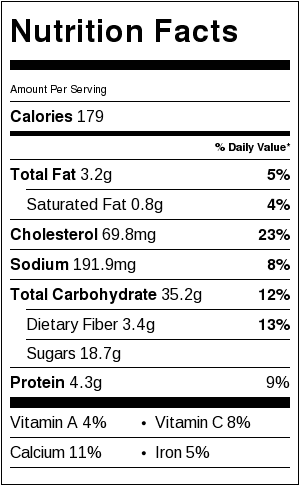 What is your favorite apple pie? Leave a comment below!